Lowcountry Local First visits the shop with special guest David Thompson (David Thonmpson Architects) to shoot a few scenes for the upcoming LLF "Buy Local" television campaign. 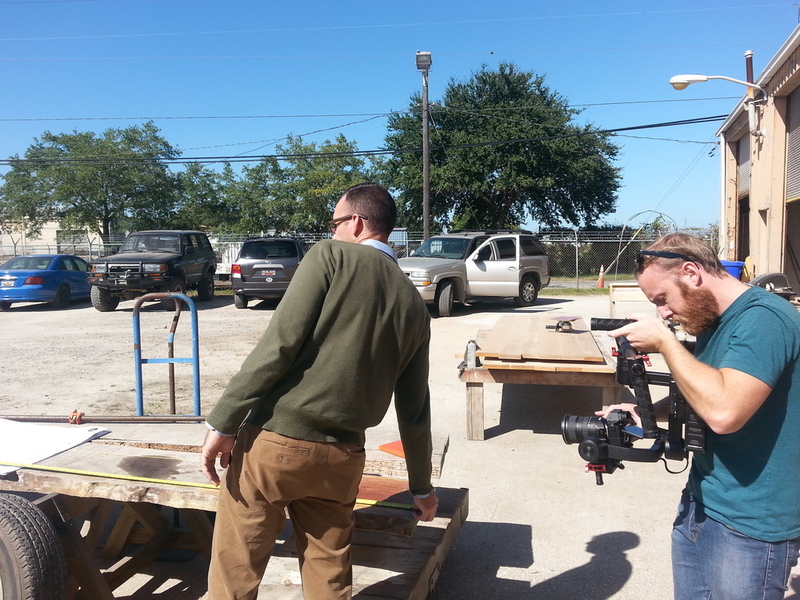 During the shoot, David and Dan discuss the possible use of this live edge Bubinga for a bar in Atlanta. The "Buy Local" campaign will feature David Thompson and local craftsman such as Perrin Woodworking while focusing on the importance of local collaboration. We were thrilled to be included in the shoot and always support local collaboration! Thank you LLF for all you do to support local businesses. Reclaimed oak timbers from a farmhouse in Virginia. Oak timbers traveled to Hollywood, SC to become boards, the shop on James Island to become furniture, and now can be found on the walls and tables of The Oak Table in Columbia, SC. 100 year old dovetail - beautiful! The process of creating a piece of furniture from reclaimed wood is a magnificent journey through time. To see craftsmanship from 100+ years ago become transformed into furniture today - is truly a work of art. Sign up with your email address to receive our monthly newsletter and get updates on new design concepts, behind the scenes of upcoming projects, local happenings, and much more….